I'll start out by saying that I don't like most millennials. Why such a brash statement you ask? It's because I feel most of them are self-absorbed; I want it now, selfish and entitled. That's how they certainly come across to us Baby Boomers. Did Baby Boomers expect much from life? Millennials are the children of baby boomers. Born roughly between the years 1982 to 1994, they began reaching adolescence around the year 2000. Millennials arrived after, but not from, Generation X. They exude a strong sense of entitlement. I don't think that baby boomers ever felt entitled to anything. Why should this millennial generation. In some ways, Millennials are more educated and diverse than previous generations. 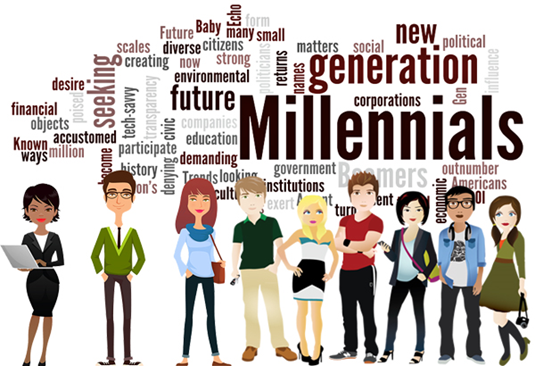 Some consider Millennials the most highly educated and diverse of all the generations, but many employers find them hard to please. Do you believe that because they're making approximately 20% less money, a result of the Great Recession, is a reason to be upset. Work a little harder and that money will make its way back eventually. Therein lays the problem. Millennials don't want to wait. They want it now or sooner. They want Mommy and Daddy to support them in New York City after graduation, so they don't have to commute. If my kids came to me and asked to do that, they would get that dead daddy stare, with a hell no thrown in for good measure. I may indulge them, but I don't spoil them. They each pay for own cell phone upgrades, part of the car insurance, and any extra items they want, not need. If they need something for a family function or school, we'll buy it for them within a reasonable price. You want something more expensive, you can pay the difference. Both of my kids work. My older one is going to have a great baby-sitting job and work one day a week at a local chain drugstore. The younger one has less free time and will work one, maybe two days a week at our local coffee/donut store. That one-day will provide her with enough money to do many things, including buying clothes and going out with her friends. You can always tell a millennial by the trendy clothes they wear and the glazed look in their eyes by spending every waking moment with their heads down looking at their cell phones. As soon as they open their mouths to speak, this fake, weird accent creeps into their speech, almost like a Valley Girl. It's like listening to fingernails on a blackboard, very annoying. I guess I don’t understand millennials. I simply don't understand what the parents did to elicit this kind of behavior. Did they not give them boundaries when they were younger? Did they receive a ridiculous weekly allowance so they didn't have to work? Yes and Yes. I was talking to a friend today who sells cars, very fast cars. The father and grandfather came in to buy a Dodge Charger for the 18-year-old boy. He asked them, are you sure? This is a powerful car, probably too much for him to handle. They assured him that's what they wanted for him. Wouldn't you know it, a week later he plows the car into a tree. The car totaled, but, luckily, the kid is okay. Do you think anyone learned a lesson? I doubt it. As I approach the age of almost a senior citizen, I think back to what my parents did for me. Yes, they indulged me, but didn't spoil me; that was for the grandparents to do and they did a very good job of it. I didn’t get a sports car as my first car. I was given a used 1970 green Volkswagen Squareback. It was a small, four-door wagon, with no heat or air conditioning. It had heat, but only after the engine warmed up and you achieved some speed. I don't even remember if there was a fan in the car. It had an AM radio and I installed an FM converter. That car developed a leak somewhere in the cabin; it actually rusted out part of the floorboard. I ended up fixing it myself with some sheet metal and glue. Eventually, the leak went away on its own. I really hated that car. Some think my ideas make me a curmudgeon. A friend of mine called me a curmudgeon. I denied it then, but embrace it now. Don't get on my bad side. I won't forget what you did or tried to do. Gawd help us when the millennials out-number the baby boomers. They'll put us in little apartments or assisted living and laugh all the way.